Book car rental online at low rates by completing the search form! Visit the real capital of French crockery with car rental Limoges! Enjoy the best online prices for car hire in Limoges! Our prices for car rental Limoges include all insurances and taxes and they are not increased at the cost of imposed or hidden services. High level of service and reasonable prices is what you can expect from car rental Limoges. Get the best car rental deals with a wide range of cars available! 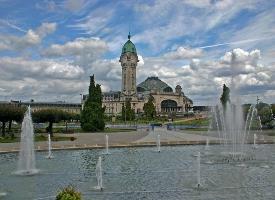 Decide on Limoges pick up location and don’t forget to check the Must Know and Places to Visit with car rental Limoges! Limoges is a small town located in the south-west of France. Is is known for many things. For example, for enamel on copper, porcelain, dating back to the 19th century, the famous oak barrels that are used in the production of brandy. In addition, there was born the famous painter Renoir. There are a lot of interesting places and attractions that were built under the influence of cultural studies of the Abbey of St. Martial. Most of the attractions of Limoges are monasteries, churches and town hall, which was built in the period from the 12th to the 17th century. 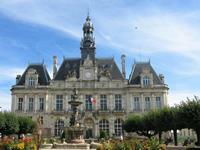 The climate is oceanic in Limoges, maybe that is why he is considered one of the warmest cities in France. 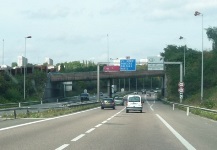 Many French motorists seem to have an aversion to driving in the right-hand lane on a three-lane road, in effect reducing it to two lanes, but it’s an offence not to move over to the right-hand lane if it’s safe to do so. It’s illegal to overtake on an inside lane unless traffic is being channelled in a different direction. Also you must always come to a complete stop when you’re faced with a Stop sign and a solid white line across the road and ensure that you stop behind the line. 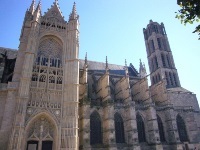 The Cathedral is the main church of the city and the place where the residence of the Bishop of Limoges is located. The construction of the cathedral was begun in the 13th century and lasted until 1888. The Cathedral of St. Stephen is performed in classic Gothic style. Inside the cathedral there are the frescoes and icons, which are available for viewing. Visit this beautiful place with car rental Limoges. The museum is located in the heart of the historic quarter of Cité, near the Cathedral of St. Stephen and you may come here using your car rental vehicle. 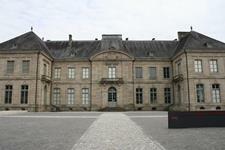 This museum features exhibits that tell about the culture and historical heritage of Limoges. There are various archaeological finds, a collection of paintings, sculptures and pictures. In addition, the museum houses one of the most famous collections of products from enamel, which have come down to our days. The construction of the town hall was completed in 1883. Its erection was directed by famous French architect Charles-Alfred Leclerc. The height of the town hall is 43 meters. On the tower there is a clock with the arms of Limoges, and on the pediments there are statues, which embody the jeweler's art and the art of enamelling. In addition, near the town hall there is a beautiful fountain, which was built in the late 19th century. Come to the hall town with your car rental Limoges and have a good time here. RentalCars24h.com offers you reliable car rental Limoges services that will help you to feel free and independent when moving around the town. Providing best online prices for car hire Limoges services, RentalCars24h.com allows you to save money each time when you rent a car in Limoges.